AJ is a 3rd grader who struggles academically and is hyper active. He has difficulty staying on task and focusing on his assignments. 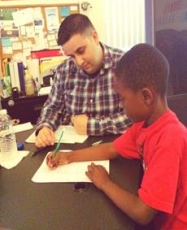 At the learning center, while receiving after school tutoring, AJ had a hard time focusing and doing his homework without the supervision of an adult. Raul still has to remind AJ to stay focused during tutoring sessions but he can see a significant improvement in his math grade and overall attitude and performance.